Made using quality, corrosion-resistant aluminium tube from BlueScope Distribution, Upton Engineering’s state-of-the-art centre pivot irrigation systems are in great demand not only across Australia but also around the world – with supply for yet another overseas project, this one for a customer in Saudi Arabia, currently in the pipeline. 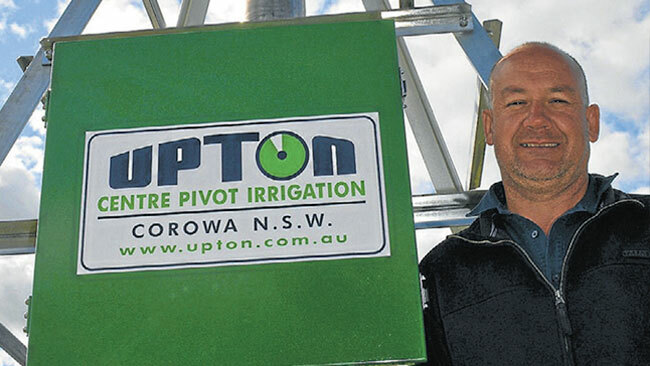 Founded in 1944 in Corowa, a NSW town on the Murray River, Upton Engineering is a third- generation, family-owned company that has established itself as one of the most versatile and complete manufacturers of agricultural irrigation in Australia. rural Australia as a result of their pioneering developments – first in heavy duty 2-wheel drive tractors and now in their renowned centre pivot irrigation equipment. Centre pivot irrigation is a method of overhead sprinkler irrigation consisting of multiple sections of pipe joined together to create long spans, with sprinklers positioned along their length, which are supported by trusses and mounted on wheeled towers. Moving in a circular pattern, they are fed with water piped to the pivot point at the centre of the circle, and can be either fixed systems or can be specifically built as a completely moveable system which can be towed from one site to another using a tractor. 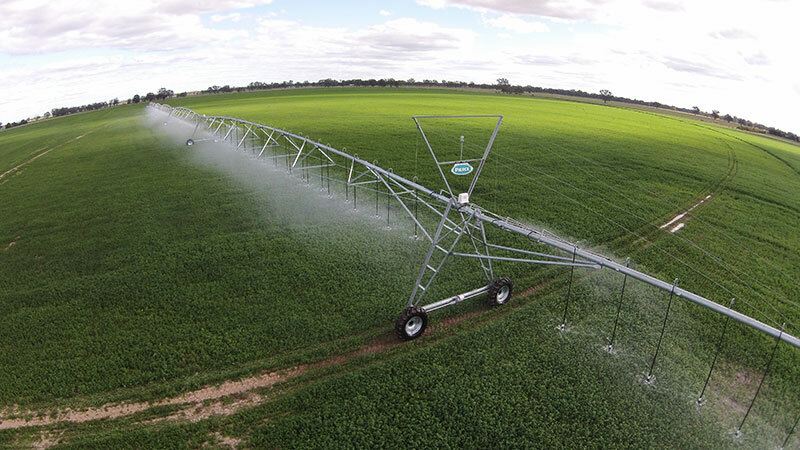 With experience unmatched by any other company, Upton Engineering manufactures fixed and towable centre pivot irrigation systems at their two-hectare industrial site in Corowa, producing machines that can irrigate areas from 10 hectares to 60 hectares in size under one ‘circle’. Dedicated as they are to producing innovative, quality equipment with a service life and warranty exceeding other brands, it’s not surprising that Upton Engineering rely on quality products from BlueScope Distribution to manufacture their premier systems. 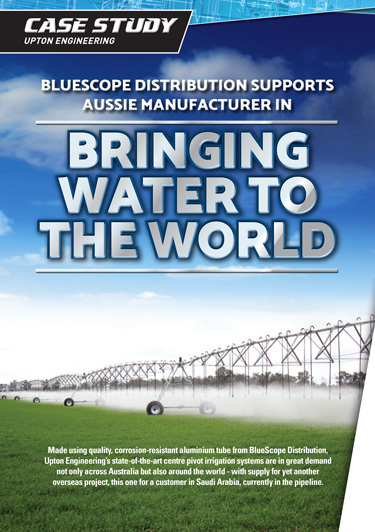 Key among these products is the marine grade, corrosion-resistant aluminium pipe, supplied by BlueScope Distribution since 1999, that Upton use to form the backbone of the main span section that carries water out to the sprinklers. “Around where we live, underground water sometimes has salt in it which is very corrosive on galvanised steel pipes. That means a shorter life span, a faster depreciating asset and more cost to farmers, so we make equipment from superior corrosion-resistant materials and also engineer tailor-made solutions for specific needs, soil types and water conditions,” Paul Upton, managing director, said. “The fact that we’ve been very successful in using aluminium on what might be termed slightly salty underground water has made our equipment extremely popular across Australia. We distribute machines basically to every state and even as far away as the north west of Western Australia, on the cattle stations, as the cattle market up there is booming because of the live export out of Broome to Asian markets. “We’ve also recently been approached by another overseas pivot manufacturer to fabricate and supply pipes for their machines for delivery into Northern Africa,” he continued. Supporting Upton Engineering in delivering their highly durable irrigation systems across Australia and the world is the enduring relationship they have with BlueScope Distribution’s nearby Albury branch – and Market Development Manager, Brian Dowling – who supply the company with essential aluminium and steel components and technical advice. 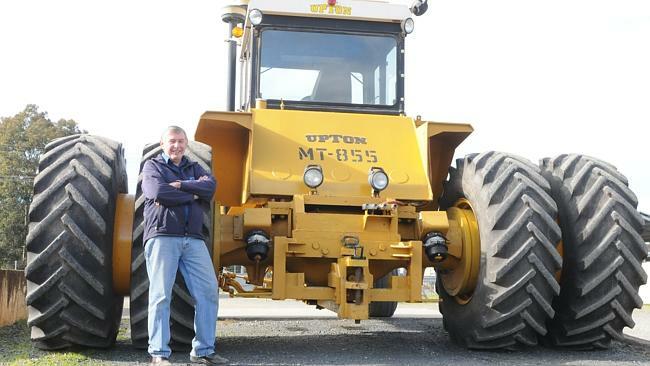 “The aluminium we provide is mainly tube and plate to make their big irrigation systems, and we do supply steel; basically almost everything but the tyres,” Brian said. “Paul got into aluminium quite a few years ago because it’s lighter, so the machine doesn’t have to work as hard and obviously it doesn’t corrode. To support Upton Engineering, I actually had our aluminium mill manufacture the dies for them, to the size and thickness they needed, and they’ve been held at the mill ever since, ready to supply product as required. “Paul knows he can call on us at any time for anything Upton requires, because he knows that we’ve got Upton’s interests at heart,” Brian concluded. “We feel we have a strong partnership with BlueScope Distribution; they’ve always been exceptional to us,” Paul Upton said. “Whether it’s unique product requirements or technical support I know that if I need anything, Brian and the team will do whatever it takes; they definitely look after us. 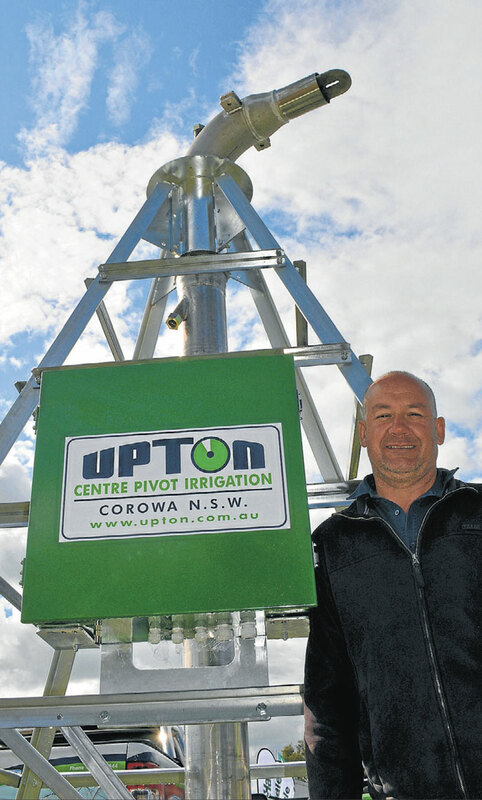 Corowa NSW based Upton Irrigation has released a new range of Australian designed and locally manufactured Linear Move Irrigators with extensive features and options that are designed to fulfil a range of applications. The new Upton Linear Move irrigators are available as a low profile version giving a crop clearance height of 1.8 metres that will be ideal for recreational turf farms and vegetable growing applications, or a higher clearance version that will be suited to broadacre or row cropping applications with an extended under pipe clearance of 3.2m? metres. The Upton Linear Moves can also designed to be towable from one watering position to the next or can pivot if required. Designer and builder Paul Upton says he has made extensive use of non-corroding materials including high grade aluminium and stainless steel pipe work. He adds “our first two new Upton Linears are already at work. This irrigator is watering an area with dimensions of 126 metres in width by a length of 260 metres or about 3.3 hectares per run, but the machine is then pivoted with water to an adjoining identical area. The second new Upton Linear Move is being used by a specialist vegetable grower who concentrates on spring onion production at Tocumwal. 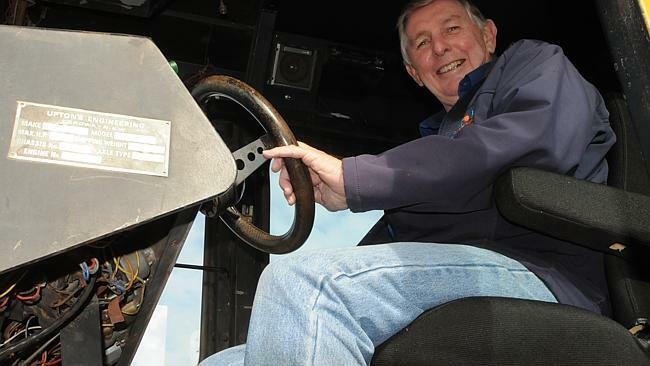 “It is watering a field area of 75 metres in width by 410 metres in length and the grower can reverse it back over the same ground as well as towing it to two more adjacent blocks of the same size” Paul Upton says. The irrigators are designed for low pressure, highly efficient water distribution. Both current machines employ low pressure Nelson Sprinklers that are designed to give a wide throw watering pattern. Mr Upton says that the design uses industry proven products with as high a local Australian content that it is possible to achieve. “Irrigators with specialist demands like vegetable growers and turf farms have up until now been forced to purchase US designed and built Linear Moves with pretty much limited flexibility.We have elected to build a Linear that uniquely meets the features our growers want and at an affordable price in $A dollars whereas imported machines priced in $US have always been expensive and with their purchasers often exposed to exchange rate variations” Mr Upton says. Founded in Corowa in 1944 the family owned third generation Irrigation and engineering company has built and installed hundreds of mobile irrigators all over Australia that are used to water a very diverse range of crops. Upton have also used their expertise to design and build special purpose irrigators including racecourse irrigators that water most of Australia’s major grass racetracks. These machines have also been exported to many prominent racecourses around the world. “We believe we have the expertise and skills in building both centre pivot and lateral move irrigators that are unique in meeting the watering needs of all types of irrigation projects. “For instance, our use of corrosion resistant high grade aluminium and stainless steel pipework in this instance makes our machines ideal for watering with lower grade or recycled water supplies. We simply invite growers to bring their field dimensions to us together with information on their source of water and desired application rates and we will prepare an Australian designed and built irrigation solution to suit” Paul Upton says. For technical enquiries or requests for further information, please feel free to contact us. 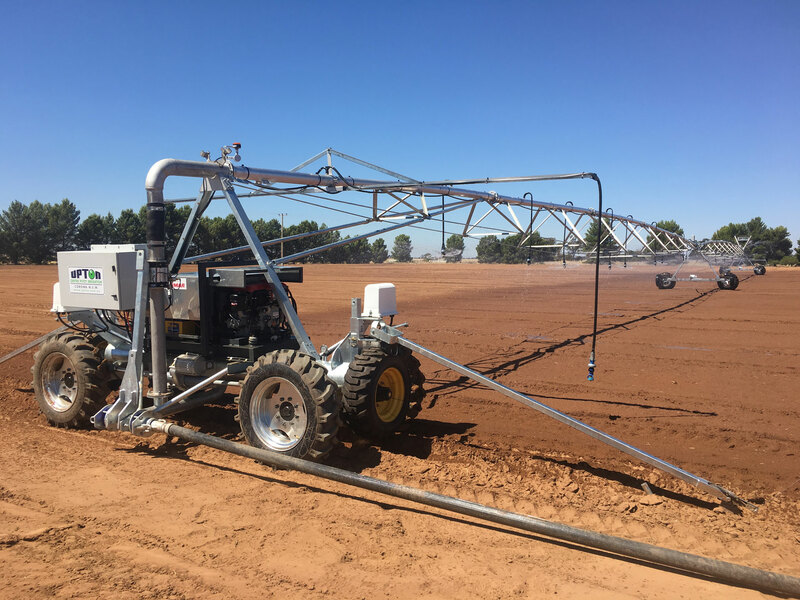 Two of the new Upton Australian designed and built Linear Move Irrigators are already working at Wahgunyah & Tocumwal.This machine is watering the polo and events field pasture adjacent to the All Saints Winery on the Murray Valley Highway at Wahgunyah. Using non-corrosive pipe work in high grade aluminium and stainless steel, the towable irrigators are available in two field clearance heights of 1.8 and 3.2 metres.Designer and builder Paul Upton says he sees significant applications potential especially in turf farm and specialist vegetable growing for the lower clearance version in particular. 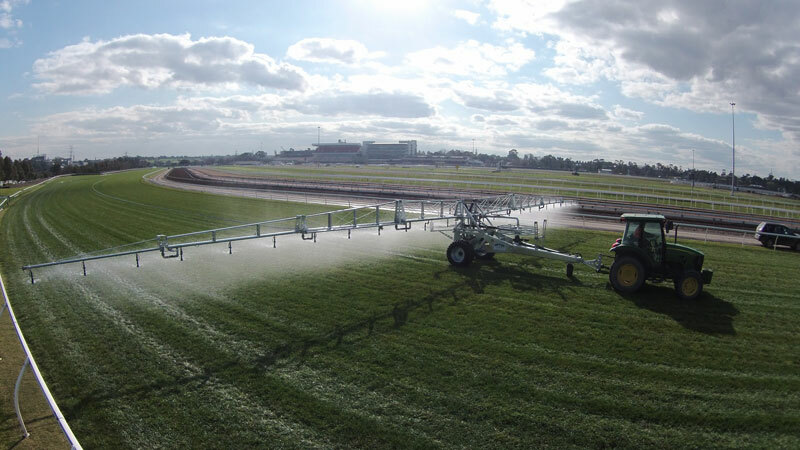 Flemington racecourse has just taken delivery of two new Upton Irriturf Racecourse irrigators to be used in preparing the grass track surface for the Spring Racing Carnival and the Emirates Melbourne Cup. The new irrigator upgrades a machine design released 20 years ago – and still used at a number of local racecourses – and exported to tracks in the USA, UK, South Africa and New Zealand. The new Upton machines at Flemington have a 30-metre wide folding galvanized steel boom and a 200-metre length of retractable hose and can water a 400-metre section of the track quickly and accurately, employing numerous control and operator features. Caulfield also has a new irrigator from Upton Engineering, a company based in Corowa, just across the Murray in NSW, and is using it this spring. The Flemington machines cover the full track width. They have four individual folding galvanized steel boom sections, which can be folded and switched off so that the boom width can be varied to avoid any obstructions or to change the spread of watering. The boom can also be raised or lowered to suit particular circumstances or to avoid distortion caused by the wind. The flexible hose is 95mm (or three inches) in diameter and is carried on a hydraulically activated wind-up reel. The hose snaps-on to a hydrant inside the running rail at every 200 metres so that the irriturf can water a total track run of 400 metres a time. The water, at a typical flow rate of 15 litres a second is applied via a choice of sprinklers fitted along each section of the boom, allowing the 400-metre section of the track to receive the equivalent of 9mm of rainfall in two hours.